I had a glorious day today. Blaster not so much, which is strangely intriguing since he was was the route master for the day. I figured since we were crowding the Harleys for tarmac, the roads were the best scenery in the area. The area of White Moutains is very beautiful, and I would consider looking further into a White Moutain area trip only, with the glimmer of hope there are some nice dual sport areas. For Blaster, who was in the "homing" mode, the roads ate too much time up. We spent nearly 12 solid hours in the saddle, and ended up mileage wise the same distance from home. 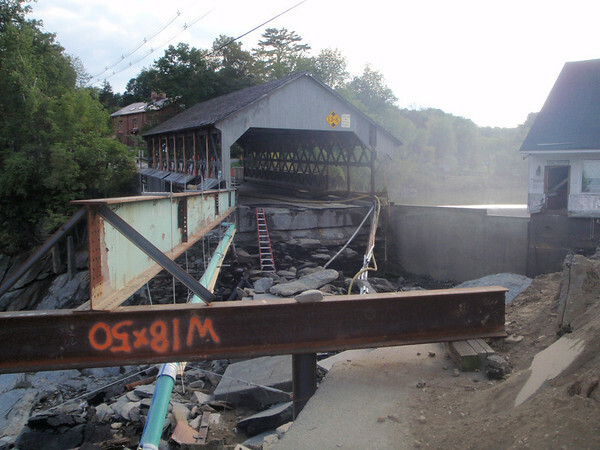 We did get a very nice impromtu tour of the hurrican Irene damage. And boy she unleash some fury. While the White Moutains got 20 inches of rain, vs the 13 inches in Maryland, the hilly terrain did focus the monsoon. Here's the only photo we took, but there was much more. It even closed 2 stretches of Interstate I-91!